In recent years, the number of extra-solar planets discovered around nearby M-type (red dwarf stars) has grown considerably. In many cases, these confirmed planets have been "Earth-like," meaning that they are terrestrial (aka. rocky) and comparable in size to Earth. These finds have been especially exciting since red dwarf stars are the most common in the universe – accounting for 85 percent of stars in the Milky Way alone. Put simply, life on Earth is thought to have emerged between 3.7 and 4.1 billion years ago (during the late Hadean or early Archean Eon), at a time when the planet's atmosphere would have been toxic to life today. Between 2.9 to 3 billion years ago, photosynthesizing bacteria began to appear and started to enrich the atmosphere with oxygen gas. As a result, Earth experienced what is known as the "Great Oxidation Event" about 2.3 billion years ago. During this time, photosynthetic organisms gradually converted Earth's atmosphere from one composed predominantly of carbon dioxide and methane to one made up of nitrogen and oxygen gas (~78 percent and 21 percent, respectively). Interestingly enough, other forms of photosynthesis are believed to have emerged even sooner than chlorophyll photosynthesis. These include retinal photosynthesis, which emerged ca. 2.5 to 3.7 billion years ago and still exists in limited niche environments today. As the name suggests, this process relies on retinal (a type of purple pigment) to absorb solar energy in the yellow-green part of the visible spectrum (400 to 500 nm). ""Photosynthesis' means 'putting together' (synthesis) by light (photo). It is a process used by plants, algae or bacteria to convert sunlight into chemical energy that fuels their activities. The chemical energy is stored in carbon-based molecules, which are synthesized from carbon dioxide and water. This process often releases oxygen as a by product, which is necessary for our existence. Overall, photosynthesis supplies all the organic compounds and most of the energy necessary for life as we know it on planet Earth. Photosynthesis arose relatively early in the evolutionary history of Earth." Studies such as these, which examine the role played by photosynthesis, are not just important because they help us to understand how life emerged on Earth. In addition, they could also help inform our understanding of whether or not life could emerge on extra-solar planets, and under what conditions this could take place. "In our paper we investigated whether photosynthesis can occur on planets in the habitable zone around low mass stars. This zone is defined as the range of distances from the star where the surface temperature of the planet allows for the existence of liquid water and the chemistry of life as we know it. For planets in that zone, we calculated the ultraviolet (UV) flux illuminating their surface as a function of the mass of their host star. Low mass stars are cooler and produce less UV photons per amount of radiation." 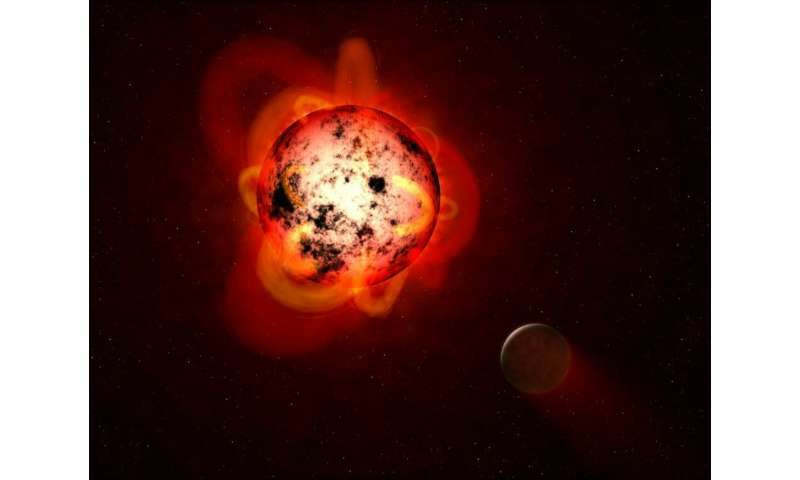 Consistent with recent finds involving red dwarf stars, their study focused on "Earth-analogs," planets that have the same basic physical parameters as Earth – i.e. radius, mass, composition, effective temperature, albedo, etc. Since the theoretical limits of photosynthesis around other stars are not well understood, they also worked with the same limits as those on Earth – between 400 to 750 nm. "This implies that the habitable planets discovered over the past few years around the nearby dwarf stars, Proxima Centauri (nearest star to the Sun, 4 light years away, 0.12 solar masses, with one habitable planet, Proxima b) and TRAPPIST-1 (40 light years away, 0.09 solar masses, with three habitable planets TRAPPIST-1e,f,g), probably do not have an Earth-like biosphere. More generally, the spectroscopic studies of the composition of the atmospheres of planets that transit their stars (like TRAPPIST-1) are unlikely to find biomarkers, such as oxygen or ozone, at detectable levels. If oxygen is found, its origin is likely to be non-biological." Naturally, there are limits to this sort of analysis. As previously noted, Lingam and Loeb indicate that the theoretical limits of photosynthesis around other stars are not well-known. Until we learn more about planetary conditions and the radiation environment around M-type stars, scientists will be forced to use metrics based on our own planet. Second, there's also the fact that M-type stars are variable and unstable compared to our Sun and experience periodic flare-ups. Citing other research, Lingam and Loeb indicate that these can have both positive and negative effects on a planet's biosphere. In short, stellar flares could provide additional UV radiation that would help trigger prebiotic chemistry, but could also be detrimental to a planet's atmosphere. 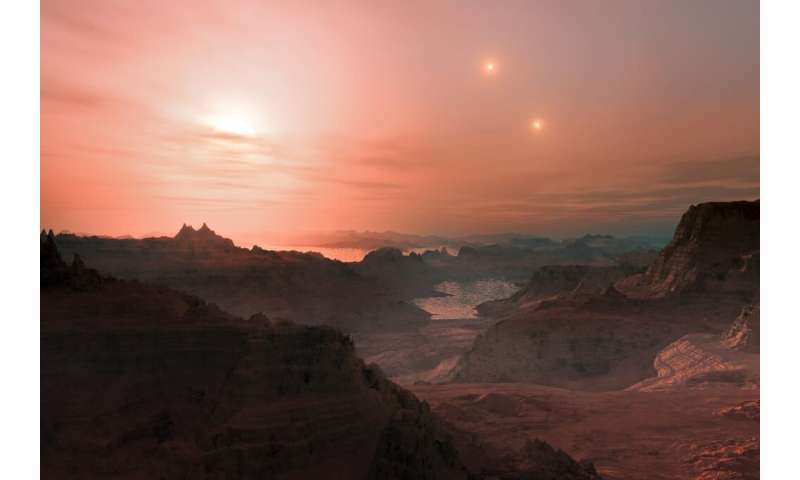 Nevertheless, barring more intensive studies of extrasolar planets that orbit red dwarf stars, scientist are forced to rely on theoretical assessments of how likely life would be on these planets. 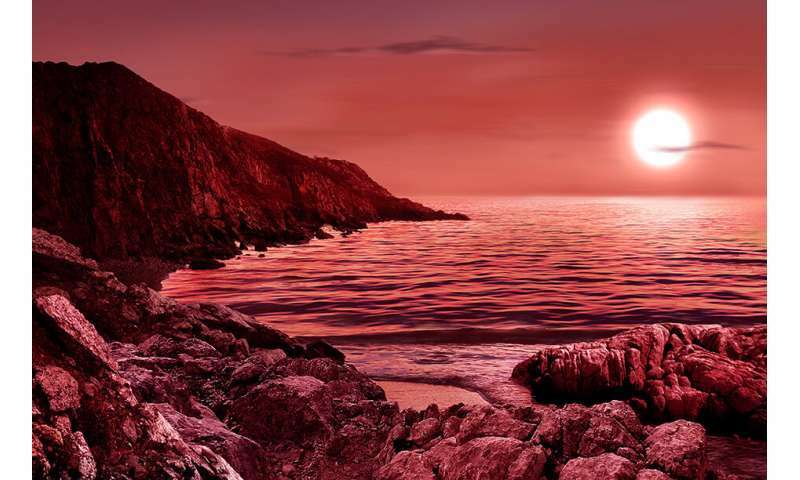 As for the findings presented in this study, they are yet another indication that red dwarf star systems may not be the most likely place to find habitable worlds. If true, these findings could also have drastic implications in the Search for Extra-Terrestrial Intelligence (SETI). "Since the oxygen produced by photosynthesis is a pre-requisite for complex life such as humans on Earth, it will also be required for technological intelligence to evolve," said Loeb. "In turn, the emergence of the latter opens up the possibility of finding life via technological signatures such as radio signals or giant artifacts." For now, the search of habitable planets and life continues to be informed by theoretical models that tell us what to be on the lookout for. At the same time, these models continue to be based on "life as we know it" – i.e. using Earth-analogs and terrestrial species as examples. Luckily, astronomers expect to learn a great deal more in the coming years thanks to the development of next-generation instruments. This is not the only problem with red dwarves, of course. The HZ is so close that the flares from these stars are not conducive to keeping an atmosphere. It seems that the Goldilock's Zone may not only describe distance from the star, but also its spectral classification. These types of so called scientific studies are too speculative, no evidence just conjecture on what amounts to slight evidence. That is the folly of using the Earth model of life. Perhaps there are other modes of photosynthesis that only requires a low level of UV flux to function. We simply do not know. I'd rather like to wait until said new telescopes can shed more definitive "light" on the subject. Pun intended. starzdust2011, I agree. When this happens I try to read these articles by looking at the actual science and drawing my own conclusions. A biologist might point out that many plants in the tropics that don't have access to the canopy thrive on very low levels of sunlight. I suspect life has found a way on some of these planets and in fact there is a good chance Earth is not the best of all worlds we all seem to think it is/was. Our temperate zone seasons in particular impose some pretty harsh conditions on flora and fauna that other planets might not have to endure to the same degree. Pun intended. We also have chemo-synthetic life not using the sun for photons at all but existing on sulfur and hydrogen and various metal ions instead. Photosynthesis is something that happened AFTER life began, and on this planet poisoned out whatever pre-oxy life forms there were. Just because the higher life forms we know on This Planet all use oxygen as a primary does not mean that all life and their own higher forms are going to follow the same rules. Chlorine and Florine are quite as active as Oxygen and under the right gravity, temperature and pressure conditions may well produce a 'higher life form' elsewhere. The Universe is a huge place, with space and time enough to try out a lot of things. Oxygen may be either an outlier on the 'Normal Life' scale universally, or may be one of the few main paths taken. I doubt it is the Only One. I think the article author made a mistake, the only mentioning of UV light in the paper, as opposed to visible, is when speculating about abiogenesis. These are upper limits based on Earth net primary production of plants, which is dominated by land plants. Algae will produce much less oxygen. And plants in an anoxic atmosphere is not reliant on photorespiration, which takes care of the secondary metabolites produced when RuBisCO makes the mistake of binding oxygen instead of carbon dioxide photosynthesis. It is also based on Earth analog oxygen sinks, as the paper notes there will be a spread so the model limits of anoxic atmospheres are fuzzy. Speculation (hypotheses) is part of science. Sometimes a good part.